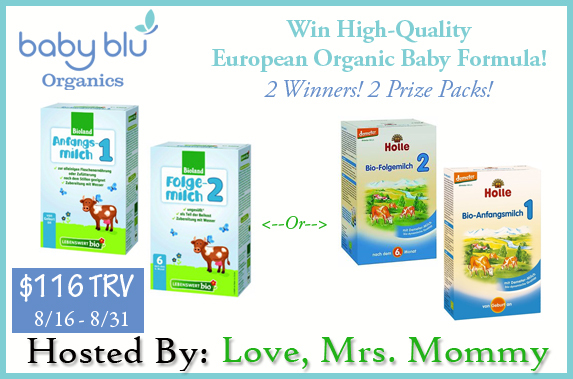 This giveaway is for Baby Blu Organics Baby Formula. There will be 2 winners who will each receive a formula prize pack worth $58. A total giveaway value of $116! Giveaway Dates ~ 8/16 9:00 AM EST through 8/31 11:59 PM EST Good Luck! If you are'nt one of the happy winners and you don't know were to get the products form Holle or Lebenswert, look at https://myorganicformula.com/. There you can get all of this products with free shipping.